Spent 3 nights at Kata Rocks and really enjoyed the setup. Amazing location, very nice villas/apartments, top restaurant. A real 5 star location, more 6 stars. You have a pulsing town of Kata just 5 minutes walking distance, but you can also relax in your private pool, watch the sun downer and then have a nice Thai dinner at the restaurant – again with an amazing atmosphere. In your apartment, you also have a complete kitchen – state of the art, again never experienced anything like this. Internet, connectivity – everything at the latest standards. Staff extremely friendly, perfect. Beautifully situated luxury resort! The resort is situated on a hillside with terraced apartments/sky villas, each with its own infinity pool. The furnishing is very tasteful, completely equipped with kitchen. Every imaginable service is available. Beautiful pool over the rock with sea view. Tasteful bar, excellent restaurant. The resort offers a free pick-up and drop-off service with caddies down to the main street. The staff is helpful and very friendly. The manager Annie offers a perfect, friendly, customer oriented service. A perfect place to relax from all the hustle and bustle of Kata and Phuket and yet close enough to take a nice evening shopping stroll to Kata. Spent an afternoon chilling out at Kata Rocks. Fabulous food. Staff that go the extra mile on service delivery, making every house guest and lunch guest feel special. The vibe, music, atmosphere and views over the spectacular infinity pool are fabulous. Special shout out to Khun Dome, the Sales & Marketing Manager, Michael, the Assistant F&B Manager, and Khun Naf, the General Manager. A credit to the Kata Rocks service ethos making the afternoon there very special. Thank you. We’ll be back soon! The best sunset bar I have ever been to. It’s really beautiful with the infinity pool. We have booked in advance to guarantee a great spot. Cocktail with reasonable price considering the vibe and service. Drinks and food both taste good. They gave us free tapas too. The sunset is magical in Kata Rock. It’s a must go in Phuket. We have a very happy evening over there. We just had dinner with friends in amazing atmosphere. The view are stunning and staff lovely. A visit here is a must next time you visit Phuket. You will not be disappointed and you will have an memorable stay. Service was also great, all staffs sepak good English, and very attentive. Thank Khun North for birthday message and cake. Our Honeymoon Package sets the stage for an incredibly romantic escape which will let you create cherished memories to last a lifetime. This Phuket Family Vacation package provides the perfect balance between quality time for the whole family and relaxation time for the parents. Enjoy a complimentary romantic spa for two guests at the Infinite Luxury Spa, when you stay two or more nights. Enjoy complimentary round trip airport transfers in a Kata Rocks luxury van, when you stay two or more nights. This season, book a two night stay in a One or Two bedroom Sky Pool Villa and receive a complimentary set dinner for two guests at the oceanfront Clubhouse. Live like a ‘VIP’ for an entire day and lounge at the iconic Kata Rocks infinity pool with our ‘Infinite Luxury Day Pass Package’. 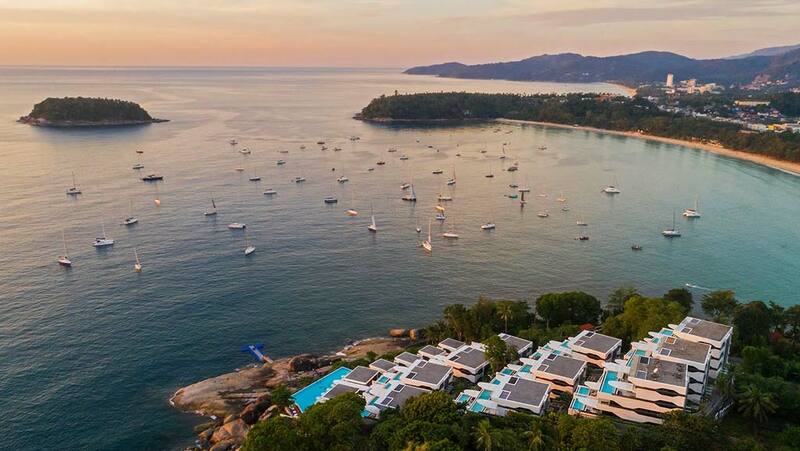 A haven of calm on the Andaman Sea, Kata Rocks is a truly remarkable resort and private residence. Our palatial Sky Villas – featuring one, two, three or four bedrooms – are set around large airy living areas, open plan kitchens and private swimming pools. A sophisticated resort in one of the world’s most romantic beach destinations, we enjoy a reputation for style, service and excellence. Modern and contemporary, elegant and cutting-edge, Kata Rocks is the ultimate Phuket destination. At Kata Rocks we offer perfection without compromise, every element of this highly successful resort is addressed with painstaking attention to detail. This allows Kata Rocks to seamlessly blend concierge-style service with a truly world class location, creating a true flagship hotel for its owning company, Infinite Luxury. 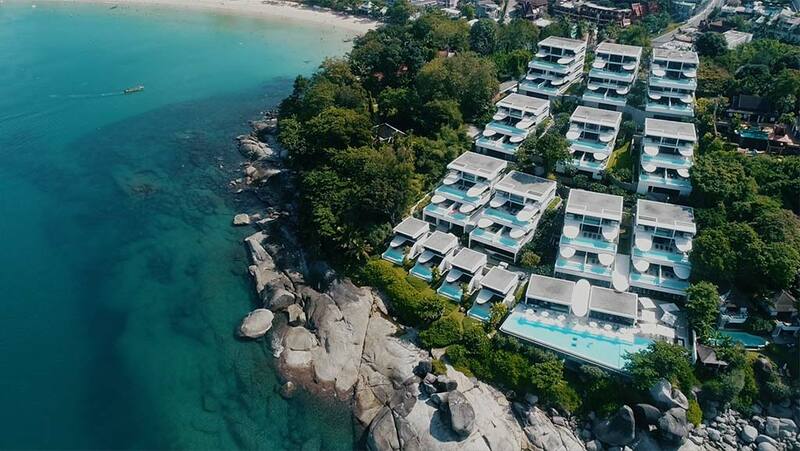 The oceanfront resort is perched on a small cape between Kata and Kata Noi beaches, where minutes turn to hours with the ebb and flow of the languorous tides. From the resort’s ocean view terraces you can see the glimmering Andaman Sea and super yachts moored off the pretty island of Koh Pu. Ponder it all from beneath white umbrellas shading contemporary sunbeds while lying in the resort’s 35-metre infinity pool, or while floating in your Sky Villa’s private infinity pool. Each of our 34 Sky Villas is built to the highest exacting standards and offers a true sense of privacy with beautiful ocean views … just perfect for sunset drinks on the expansive outdoor terrace. With full home automation and iPad control of everything from the blinds to ordering a club sandwich, Kata Rocks is your dream destination. The cuisine at the Bar and Restaurant at Kata Rocks is exceptional: fresh oysters, local seafood and tapas are a few of the house specialties and are bliss with a glass of crisp white or robust red from our state-of-the-art Enomatic wine dispenser. Destination dining options include oceanfront picnics ‘on the rocks’ or gourmet meals prepared in the privacy of your Sky Villa by your own personal chef. 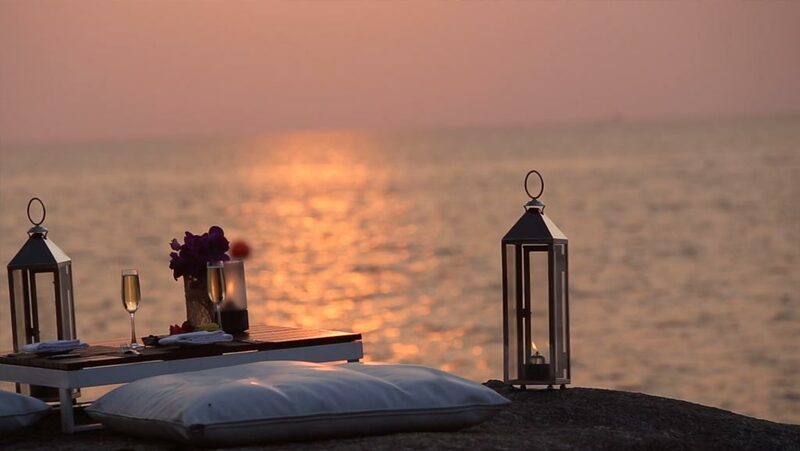 Known as top romantic restaurant in Phuket you will enjoy dining in your villa or our awarded best restaurant. Our Infinite Luxury Spa delivers heavenly therapies that rejuvenate and relax your body and soul. Each treatment is unique, using only the best natural organic spa ingredients from ILA spa to achieve the ultimate indulgent spa experience. As the best spa in Phuket you will experience stunning Thai spa massages and personalised service.